How quickly things change in football. Just over a year ago, Bradley Bubb was part of the Farnborough side which ended Woking's promotion's dream in a dramatic Blue Square Bet South play-off semi-final. A month later, he'd earned a move into the Football League with local rivals Aldershot Town. Now, he's wearing the Cardinal red and white after agreeing a one-year loan deal from the League Two club, where he's found his opportunities limited. Watching my Dad play. It was tearing down with rain and I was on the sidelines with a ball at my feet. Who did he play for? And who were your heroes growing up? It was team called Nissan. My hero was Ronaldo, aka R9, he was the best player ever. I used to have a pair of R9 boots, they were the business. You joined Woking on loan last week - what are your first impressions? They are very good; good team and team spirit. I know about the club, they have a good following and have always had a good team each year. What memories do you have of coming up against them in derbies when you were a Farnborough player? Erm... the play-off semi-final [in 2011]. I think it was a great game and the fans from both teams were out in numbers. Great games, both the first and second legs. Your twitter bio tells me you're a big tattoo fan. How many have you got and which is your favourite? I've nearly finished both arms and one across my chest and one on each arm. My favourite one is my chest - it says "No-one can outrun their destiny". Talk me through the best goal you've ever scored. It was a half-volley, about 35 yards out, top corner, a few years ago away at Truro City. What does it mean to you to play international football for Grenada? What do you remember about your debut? It means the world to me, representing my Dad's country. It was against Trinidad & Tobago and we won 1-0. To hear the national anthem play was amazing. It sounds like you're from quite a sporting family. Does much banter fly around between you, Byron and Alvin? Yeah, a little bit. Byron still thinks he can play in the Premier League and Alvin thinks he's the fastest still. That's a whole massive argument with all my other cousins that play football - who's the best in the family. Away from family, who are your best friends in football? 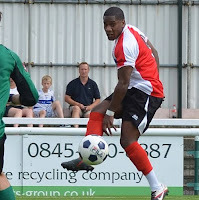 There's a few like Anthony Straker [Southend / Grenada] and Danny Hylton [Aldershot], but a few that play non-league too. What made you decide to come on loan to Woking for this season? Well, just to get playing at a good level really, and I know Woking is a club on the up. Do you feel like you still have something to prove as an Aldershot player? Yeah, I feel I do. I haven't really played much and I'd like to show people what I can do. Football is a funny game, it takes people on journeys and I know this will be a good journey. You've now got more than 1,000 followers on Twitter. What are the best and worst things about being a tweeting footballer? Best thing is the banter, but the worst is when you say something and it gets twisted. You have to watch what you say. Who's the best manager you've worked under? Probably Steve King [at Farnborough]. He got me scoring from a number of different positions and let me express myself and enjoy football. How do you look back on this particular incident? [see below, Bubb is wearing 7] Have you been involved in anything as bizarre, before or since? Nah, I've never been involved in something like that. It was funny. I'm just happy that I scored the penalty - it just crept in. Is there less pressure on you when you're a loan player? Nah, not really, because I want to prove a point to everyone. What sort of player should Woking fans expect to see? Strong, quick, hopefully a goalscorer. I'd say Dean McDonald - he used to do unbelievable things - and Daryl McMahon [both former Farnborough team-mates]. Against, there's been a lot of players, I can't pick one. What music do you listen to just before a game to get you in the mood? I like a bit of house music or rap. Finally, what are your hopes and dreams for this season - for you individually and for your club(s)? To get double figures and to help Woking win the league. It would be massive for the club.